Last week I delivered food to a client and the house keeper was there. We both had keyed into the apartment to do our jobs. She stopped vacuuming and came over to the refrigerator and watched me unpack the food bag and load the shelves. She asked about each dish, she tried to guess what was in each container. I described the food I had prepared and explained a bit about my system and how I help people with weekly food dropoffs. I was in a hurry, and slightly annoyed, but she was so interested in my job. It seemed like a gift I was giving her in the middle of her workday, an escape from her own task. I obliged. Before I left the apartment, she looked me in the eyes and said, “I’ll never know what any of that tastes like, but I know you cooked it with pleasure. You must be really good at what you do because the love is shining out through those containers.” Why thank you, angel lady, for making me slow down so I could receive YOUR light! Last month, one of my culinary heroes, Gabrielle Hamilton, owner of the restaurant Prune in New York City and food writer for the New York Times, wrote an article called Cooking Duck Not With Love, But With Pleasure. Had this housekeeper read the article? Did she know that this article has been stuck in my mind and I've been thinking about how my cooking is perceived by my clients? Can they taste how much I love my job? You don't have to cook with love, no one can really taste that. But if you cook with pleasure, it will definitely shine through. If I'm a 'bitter betty' as I'm cooking, that will affect my dishes. Nobody wants to ingest my bad mood - not in conversation, not in interaction, and above all not in something they are paying me to cook for them. The pleasure principle is a very important component. If we do anything with pleasure, it will shine through. On street corners in NYC, I see so many school traffic guards waving and smiling to kids, appearing to love what they do. For some of those kids, that may be the only smile they get that day. I see shoe shiners in Grand Central Station whistling and actually putting pep into the step of the business men waiting for their trains. They seem to be taking a great deal of pride in their job. Just seeing them puts a pep in my step. What we do, big or small, has an impact. I know we don’t all love our jobs. Many days, I’m sure there is no pleasure to be found in the Monday to Friday, 9 to 5 lifestyle. It’s a paycheck. It’s an obligation, and sometimes a sacrifice. The work is unfulfilling, soul-sucking, and on and on and on. So what to do? I could say ACT AS IF things are peachy. I won’t. I could say quit and follow your true passion. I won’t. Masking a situation or running away from responsibilities are not the answers. But I will say this: facts are facts. The truth of a situation cannot be changed and oftentimes we don’t have control over what is happening. But what we DO have control over is our perspective. Our reactions to the things around us. How we respond is the thing that really colors a situation. Pleasure elevates the mundane. It’s the icing or gravy that makes the ordinary extraordinary. A good friend recently asked, “What lights you up?” Aha! This just knocked me out. If we can identify the things in life that illuminate our world, our own personal existence, and we find a way to turn that light on for ourselves, just think of all the light we can provide the greater world. It’s our duty to project that light, and protect that light, change the bulb, feed the fire, whatever! What lights you up? Do you have a treasured poem or work of art? A tune that you hear and it instantly improves your mood? A tie or pocket square that makes you feel good about yourself? These are tools we can employ to bring pleasure, to create more light. If it's a poem that brings you pleasure, copy the poem and slip it in your desk. Look at it once a day. If it's music, make a lunchtime playlist that you can listen to on your break that will get you through the end of the day. If fashion is your thing, wear your special item of clothing and share the joy that it brings you! Maybe what lights you up are the things you’ll do once you leave work, or how you’ll reward yourself over the weekend. Holding your pets, singing your children to sleep, painting, volunteering, brunch with friends, going to church... DO THOSE THINGS. They will improve the quality of your life, which will improve the quality of life of everyone around you. This is important work. Times are dark right now, so do what lights you up! What lights me up? This blog, this little community, my kitty cat Franklin, dance class, my temple, theatre, field trips out of the city. New ingredients. New cooking techniques. Discovering new recipes or returning to old favorite ones. This week I am totally lit up by bathing a whole head of cauliflower in Pomora’s golden olive oil, massaging turmeric and salt into all the nooks and crannies, and roasting it in the oven. Talk about the pleasure principle! The touch, the smell, the color, and the eventual taste - it’s incredibly pleasing and great fun! Pomora Olive Oils in my kitchen this year are one of my favorite additions. Why? Because I can taste the love, the pleasure the olive growers Carmelo and Antonio put into each tin of olive oil. When you love what you do it shines through. You can bring some light into your kitchen or into the kitchen of someone you love with Pomora Olive Oils this year. Adopt a tree and receive 3 tins of oil every quarter. And add this recipe to your Thanksgiving menu lineup. It will make your holiday table shine. Preheat the oven to 400 degrees. Place the cauliflower in a roasting pan and coat with 1/2 cup olive oil. Use your hands to rub it into all the nooks and crannies until evenly coated. Evenly dust the cauliflower with the turmeric powder, getting underneath on the core side as well. Season generously with salt and pepper. Place the cauliflower in the oven, core side down, and cook until it is tender when pierced with a knife, at least 1 hour. Halfway through the cook time, turn it over so the core side is up. Increase the oven temperature to broil or adjust the pan to make the cauliflower closer to the heat /flame source. Turn the cauliflower right side up and broil for 3 minutes or until the whole head is golden and browning. Remove from the oven and let it rest for 5 minutes before slicing into steaks. Drizzle with more Pomora oil, Garnish with the pomegranate seeds and chopped mint. 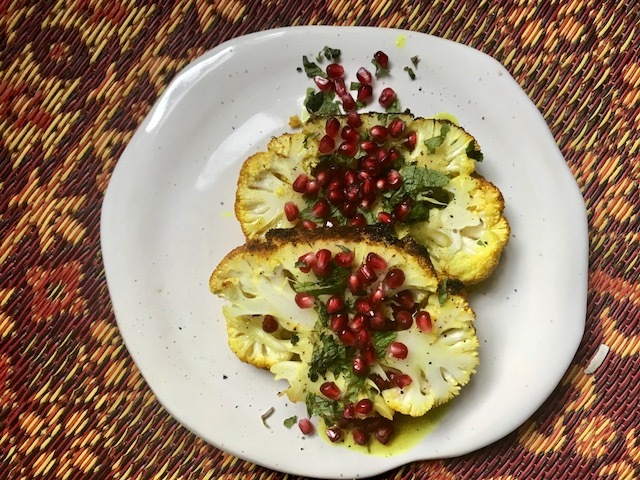 Tags Pomora Olive Oil, Whole roasted Cauliflower With turmeric, Gabriel Hamilton, Love Your Job, Take Pleasure In All You Do, What lights you up?